Ben Thornhill has been collecting professional model bats for quite some time, from the legends of yesteryear to the stars of today. Like most game-used lumber collectors, Thornhill is drawn to the tools of the trade, the connection to the player that a gamer represents. From Stan Musial to Johnny Bench to Derek Jeter, Thornhill’s collection of bats spans several decades. With the 2014 baseball season upon us, we take an in-depth look into the world of bats through a passionate collector's eyes. 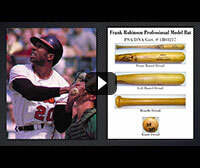 Athletes, including many baseball players, have been endorsing products for well over 100 years. From tobacco to candy to Wheaties, baseball players have been involved in the promotion of a host of consumer goods for well over a century. In the 1920s, Babe Ruth may have taken endorsements to a whole new level but there is a rich history that predates the Sultan of Swat. In the following article, John Thorn takes a look into the history of athlete endorsements, which leads us to an upcoming auction item...one of the most remarkable advertising pieces known. Single-signed baseballs have always been the preferred medium for autograph collectors. In some cases, it is the preferred medium even for non-baseball autographs like presidents and music legends. One of the more creative sets recognized in 2013 is this comprehensive set of autographs. It contains a single-signed baseball of every Cy Young Award winner, from both the American and National League, in baseball history (1956-present). Great names like Sandy Koufax, Bob Gibson, Warren Spahn, Roger Clemens and Don Drysdale fill the list. Some were perennial All Stars while others were one-year wonders, but in order to complete the set, you needed 71 different baseballs at the awards deadline. Last year’s winner is the first to reach 100% completion, and the average condition of the signed baseballs is hovering around a lofty PSA 9. Click here to view this set. 2014 PSA Set Registry Awards! The deadline for this year’s PSA Set Registry Awards is Friday, May 30th. Any new sets or edits to existing sets must be published before 5:00 pm EST (2:00 pm PST). The deadline to request that new cards be added to the set composites is April 30th. Set composites will be updated with these requests, assuming they qualify and are approved, by May 30th. Requests received after April 30th will be added as optional. After June 1st, the new additions will be required. In the Goldin Auctions 2014 Opening Day Auction, one fortunate collector will have the chance to own a one-of-a-kind 2002 Aston Martin Vanquish sports car produced exclusively for the Naismith Memorial Basketball Hall of Fame 50th anniversary celebration. As an added bonus, the rare automobile is autographed by 50 basketball Hall of Famers including; Michael Jordan, Charles Barkley, David Robinson, Moses Malone, John Havlicek and many others. Fresh off a sale of a 1975 Topps Baseball unopened cello case that brought $66,570, Collect Auctions again has an excellent assortment of unopened material in a sale that just opened and ends April 3. PWCC is offering 6,380 high-end lots, spanning all sports and genres, auctions closing now through April 14. With the start of a new baseball season fast approaching, Mile High Card Company is pleased to announce the commencement of the Spring Auction, running from March 25th through April 10th. This auction features many high grade and low pop cards for collectors to complete their sets from the 1950s through the 1970s. Giovanni Sports Auctions – 2014 Spring Auction Opens April 4. Ends April 15! 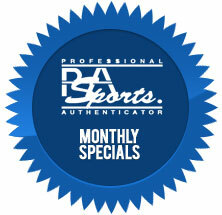 The auction features many quality PSA and PSA/DNA Certified items. Lots include cards from iconic sets such as T206, Cracker Jack, Allen & Ginter and more along with many Hall of Fame & Super Star Certified Autographs from Ruth, Cobb, Mantle and more. Greg Bussineau Sports Rarities is pleased to announce the successful completion of its Spring 2014 catalog/internet auction event. Based on preliminary sales results, the auction generated total prices realized of $803,556. This auction features another amazing array of sports and non-sports items that caters to every level of collector and investor. Whether you only want to spend a few hundred dollars or several thousand dollars, our selection of quality items has a little something for just about everyone. This auction is headlined by the first installment of an incredible Baltimore Area Collection from long time collector Robert Franklin. Which of the following professional model bats do you think is the most undervalued?